On September 12, 2006, Pope Benedict XVI took to the dais of the University of Regensburg’s Aula Magna to offer a few “memories and reflections.” Contrary to the resulting rebukes, the 79-year-old pontiff knew exactly what he was doing. Ten years ago Pope Benedict XVI took to the dais of the University of Regensburg’s Aula Magna to offer a few “memories and reflections.” The speech, which became widely known simply as Regensburg, has long been dismissed as an infamous gaffe in a generally misunderstood pontificate; it was leveled as incendiary and undiplomatic in solemn rebukes from leaders like Jacques Chirac; it sparked firebombings and effigies; death threats from the Mujahideen Army against the pontiff; and generally did little to enhance Benedict’s reputation. But how much of Regensburg was actually read, understood, and properly digested, and what was its overall intention? Contrary to the ensuing censure of the Pope and his speech, the 79-year-old pontiff knew exactly what he was doing. “As I said at the time,” stated Fr. James V. Schall, SJ about its lasting legacy, “this address is one of the world’s most penetrating analysis ever made of intelligence and the consequences of the willful refusal to face its truth.” If really taken to heart, Regensburg at one point may have been the touchstone for a more truthful world—and still might be, a decade later. The address consists of 4,000 words and 16 paragraphs—one paragraph is for the introduction, three on Islam, and two its conclusion, leaving ten paragraphs devoted to the issue of “reason.” Yet, this issue of reason and its relationship to God is rarely the topic of debate or discussion about the address. That is reserved almost entirely for the short section about Islam, particularly Benedict’s citation of a 14th century Byzantine emperor, Manuel II, a quotation which the Pope himself prefaced as one of “startling brusqueness, a brusqueness that we find unacceptable.” The emperor’s statement—“Show me just what Mohammed brought that was new, and there you will find things only evil and inhuman, such as his command to spread by the sword the faith he preached”—is the most cited passage, and the one sometimes leveled against Pope Ratzinger as his own. Even Benedict sought to moderate tension the Sunday after Regensburg: “I am deeply sorry for the reactions in some countries to a few passages of my address at the University of Regensburg, which were considered offensive to the sensibility of Muslims. These in fact were a quotation from a medieval text, which do not in any way express my personal thought.” But should the Pope have apologized for being magnificent? At the time of the Charlie Hebdo massacre in January 2015, Dr. Samuel Gregg recalled Regensburg, something not a few thinkers were doing with frequency in light of such attacks: “Many professional interfaith dialoguers don’t like the Regensburg address because it highlighted how much of their discussion was utterly peripheral to the main game,” he said. Now in the ten years since 2006, in the wake of the Arab Spring, expanding terrorist attacks, a media blitzkrieg by Islamic State touting beheadings of Westerners, Coptic Christians and others, global financial chaos, a Europe struggling in its own narrative, a United States enduring an identity crisis, the brilliance and bluntness of Regensburg remains. It comes down to a matter of the truth: Was the Pope really on to something of such magnitude it was completely overlooked by an unprepared public? Looking back, Pope Benedict’s penetrating diagnosis of the intellectual, moral, and spiritual pathologies that are spawned by our late modern flights from reason—whether these are born out of religious voluntarism or scientific reductionism or cultural perspectivalism or, increasingly, religiously motivated humanitarianism—is, in many ways, more relevant today than it was a mere ten years ago. Truth be told, the Church and the West still have much to learn from the Regensburg Lecture. Benedict’s aim is not to champion reason alone, but ratio recta—right reason. It’s a direct challenge to the pervading dictatorship of relativism he has long sought to confront and crush. Such tyranny extends down to the very universities meant to explore that reason in multiple subjects of life. It is no accident that Benedict chose a university setting and directed his Address to “representatives of science.” As recent social crises in academia have revealed, the typical foundation for a university as a place of discourse on ranges of ideas is now a shrinking footprint. Doing so inevitably excludes real discussion of God. Not only is the subject of God the central theme of Joseph Ratzinger’s life, but the central theme of the great thinkers and civilizations in history. It was of such import that Regensburg could not ignore exposing the attempt to replace God totally: “A reason which is deaf to the divine and which relegates religion into the realm of subcultures is incapable of entering into the dialogue of cultures.” Is this right reason, the kind of reason now realigning public discourse, the public way of life? 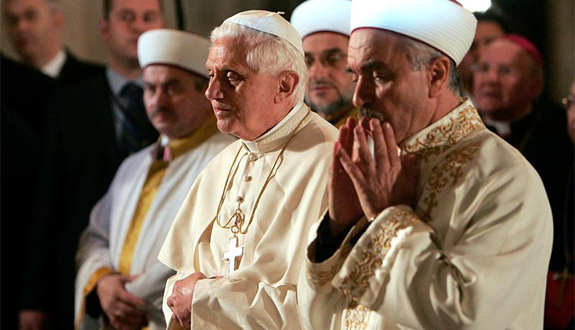 Benedict XVI’s Regensburg lecture was as much about the West’s crisis of faith in reason as it was about the deeper theological problems driving Islamist terrorism. If the West forgets that the Jewish and Christian God is, in fact, not just Love (Caritas) but also Divine Reason (Logos), then it cannot help but collapse into mere sentimental humanitarianism. The present prevalence of feelings-talk and emotivism in much of Western Christianity, including among some prominent Catholics, and their evident disinterest in right reason and natural law tells us that Benedict’s warnings were right on the mark. In his own lecture given in 2007 at James Madison University explicating both Benedict at Regensburg and Alexander Solzhenitsyn’s 1978 Harvard commencement address, Fr. Schall observes Benedict’s grasp of limitation—limits of government and its influences on the human person; limits on human life itself; the Kantian limits of reason alone; and the limits of sola scriptura, for instance. Determine the degree of limitation on reason and there you will define what you really believe—that is the challenge of Regensburg. It is so challenging we dare not address it, instead choosing to occupy our passions and anger on the branches rather than the root of what is. Threats of enforcement of political correctness, and in some cases, of terrorist attacks increasingly place in jeopardy models of faith and reason housed in the sanctuaries dedicated to the cultivation of these spiritual gifts. Increasingly, professors of the life of reason (and/or of faith) labor in the shadow of threats against their livelihood and sometimes against their very lives. Pope Benedict’s witness manifested what cost might be exacted of those who labor in universities as well as in Christian churches. For those dauntless in following Benedict’s lead, perhaps such charting of a better course indeed will happen within a university, where such discourse was intended. And maybe it will take place this year, when a bold professor or daring staff member inspired by the courage of Benedict the Brave makes Regensburg required reading either in the classroom or in some clandestine meeting of counterculturals yearning for change, who know that two wings are needed to soar. To see past the layers of distraction created by controversy and to meet Benedict where he wanted to take not only the faithful but all people of goodwill: to new heights of intellect and faith. James Day is the author of Father Benedict: The Spiritual and Intellectual Legacy of Pope Benedict XVI (Sophia Institute Press, 2016). He is a producer and operations manager for EWTN’s West Coast Studio at the Christ Cathedral campus in Orange County, California. Tim Kaine is so clueless about the Bible, he must be Catholic!